A wide range of problems can be modelled as constraint satisfaction problems (CSPs), that is, a set of constraints that must be satisfied simultaneously. Constraints can either be represented extensionally, by explicitly listing allowed combinations of values, or implicitly, by special-purpose algorithms provided by a solver. 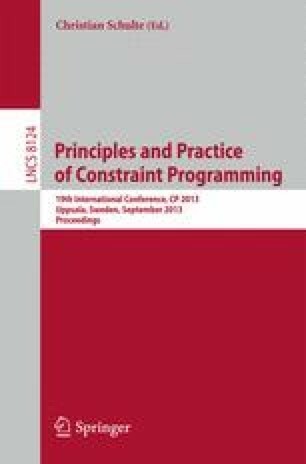 Such implicitly represented constraints, known as global constraints, are widely used; indeed, they are one of the key reasons for the success of constraint programming in solving real-world problems. In recent years, a variety of restrictions on the structure of CSP instances that yield tractable classes have been identified. However, many such restrictions fail to guarantee tractability for CSPs with global constraints. In this paper, we investigate the properties of extensionally represented constraints that these restrictions exploit to achieve tractability, and show that there are large classes of global constraints that also possess these properties. This allows us to lift these restrictions to the global case, and identify new tractable classes of CSPs with global constraints.